Every issue, landscape designer Darbi Davis digs deep to bring you stories for your outdoor space. This month: making the case for clotheslines. Cover photo courtesy of Steve Martino. It used to be a domestic art complete with cultural quirks, abundant conversation, memory making, and a visual record of trends and the passing of time, as clothes changed shape and hemlines rose and fell to reveal the latest fashions. But clotheslines disappeared with the onset of the dryer, when the convenience of a machine sent the string into extinction. At the turn of the millennium, dryer usage accounted for 6% of household electricity use in the United States, according to the Department of Energy. The Environmental Protection Agency estimates that residential dryers consume 445 million therms of natural gas annually, leading to carbon dioxide emissions of 32 million metric tons. We should be grateful that the sun doesn’t hold grudges, as we scurry to bottle its energy, save money, and reverse what we created. 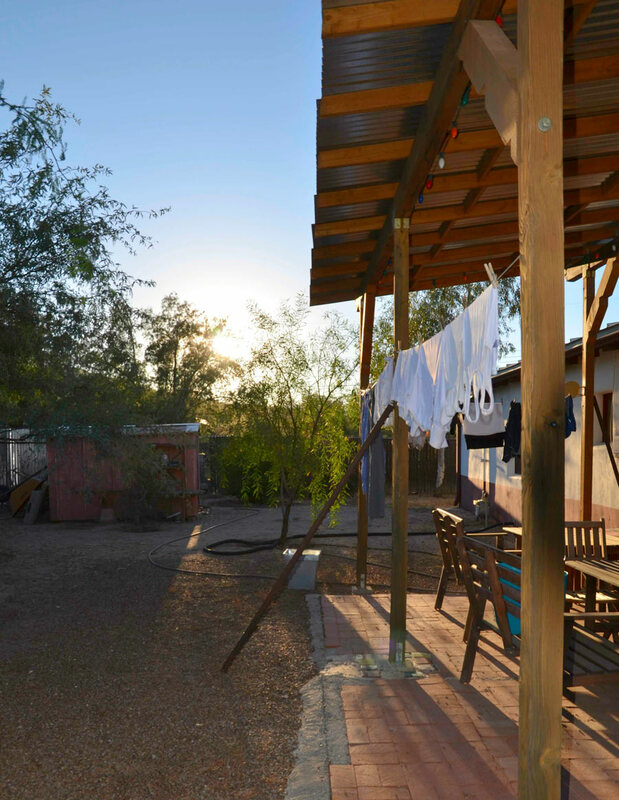 The clothesline seems like an obvious energy-saving device, especially in southern Arizona – a place that has abundant sunshine and heat almost all year round. Who wouldn’t want to save money, energy, and get outside more often – especially in our funky, arid town? And anyway, there’s nothing easier, or cheaper: some taut rope, two trees, and the sun’s rays. Sadly, some view the clothesline as a property- value-reducing eyesore. As a result, the most basic of energy saving concepts is banned in some residential communities and regulated through Homeowner Associations and their CC&R’s (Covenants, Conditions and Restrictions) – citing terms such as nuisance and unsightliness. Hence the ‘Right to Dry’ movement and websites such as laundrylist.org, where you’ll find maps that indicate where it’s permissible and prohibited, complete with hefty fines, to let it all hang out and a wealth of information on your right to dry. The good news for us in Tucson is that Solar Access Laws prevent the anti-line-dry laws from being valid in Arizona (and many other states). But still, some communities in our county have banned clothelines. 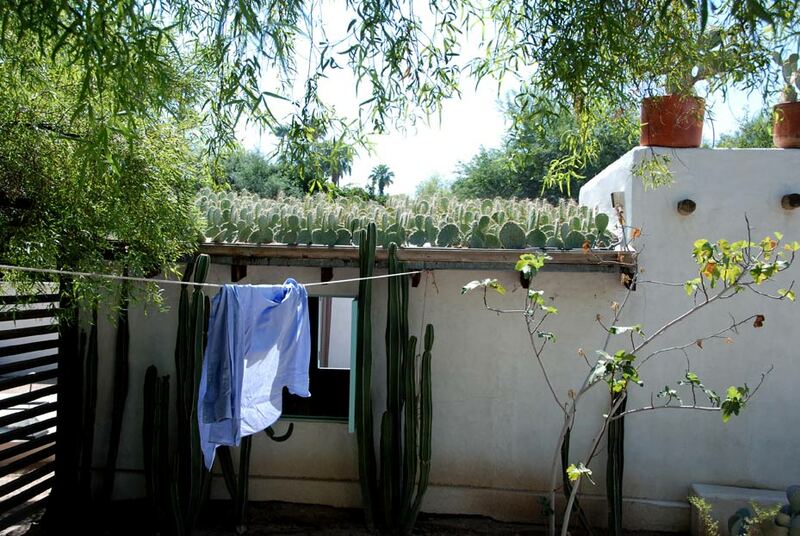 Tucson resident Hope Reed loves her clothesline which stretches from the ramada to a trellis across the backyard of her barrio abode. “I love my clothesline. Crisp sheets are the best, and I feel like a jerk running the dryer when our yard is often like a big oven,” says Hope. When Monica Negri, wardrobe consultant and owner of Ten Outfits, first suggested a clothesline to her husband, he scoffed. “Being who I am, I negated his opinion and went out and bought one anyway,” she says. The fact is, clotheslines literally can be art – and that bucks the notion that it’s an eyesore. They can also help with passive cooling. 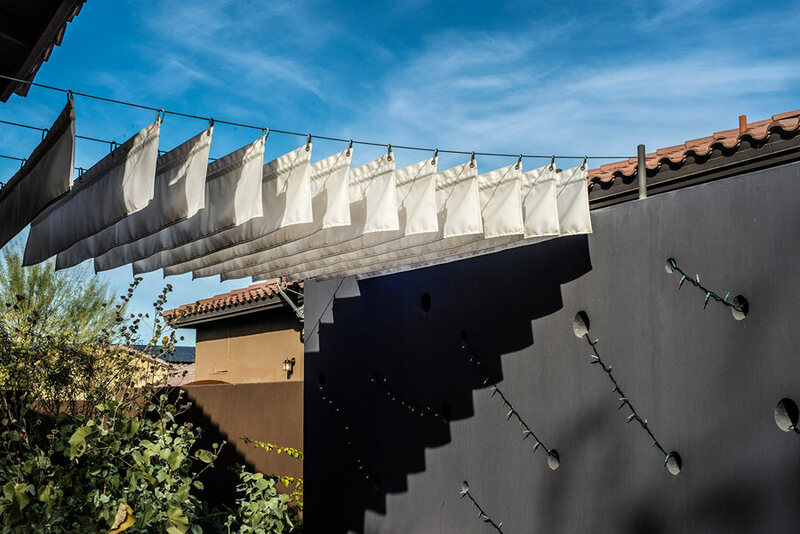 For example, an artfully designed clothesline on the west side of a home might shade a west facing wall when used during certain times of the day. That is exactly what is planned for this Menlo Park property I am currently working on (pictured opposite). The clothesline will move from the Ramada to the west side where a hefty line will span between two abstract metal sculptures (one is currently functioning as modern outdoor art and the other was found laying helpless behind a shed). Ironically, the metal sculpture and its not-so-loved partner are classic, rusted, and repurposed clothesline poles from an era when clotheslines were the only option. National Hanging Out Day is April 19th, which seems like a perfect opportunity to rekindle a clothesline ritual. Aesthetic options are endless, but keep it simple and the chances of a weekly routine settling in might be greater. The process, while a bit longer than dumping into a dryer, offers a moment of fresh air, a break from the indoors, and hopefully a feeling that you are doing some good for the planet – and saving money while you’re at it. These are from South America but do exceptionally well in our climate. They have the most spectacular display of flowers typically later in the Spring. 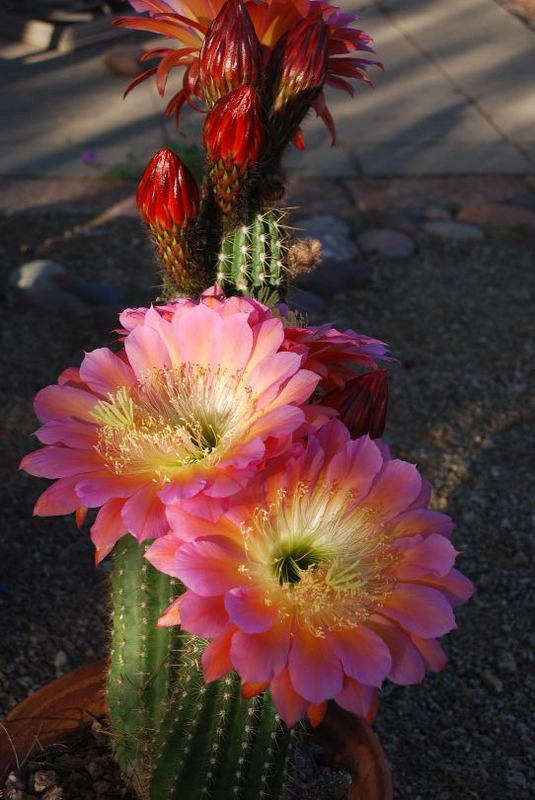 But, possibly due to our warm winter in Southern Arizona, they are flowering earlier this year. Photographs can hardly capture their beauty.